Financiers (sometimes called friands) are a good way to use up egg whites, especially after a summer’s accumulation of making ice cream. Typically made with almond meal, I made these with a meal from roasted hazelnuts. Delicious. I also made another version with cashew meal, which were milder, but still tasty. In the future I might try this out with hazelnut meal that has been lightly roasted in a pan. Recipe adapted from recipes by Stephanie Alexander ( The Cook’s Companion , 2004) and Chocolate and Zucchini. I didn’t have a financier baking pan, so instead used a 24-cavity brownie bite silicone pan (baked in two batches), where each mold is about 20ml (1 tablespoon + 1 teaspoon). A mini muffin pan would also work, but you might need to adjust the baking time if the volume is larger (or smaller). This recipe made 48 financiers. (optional) semisweet or bittersweet chocolate discs; they’re larger than regular chips, at least twice bigger, depending on the brand — I like Guittard. Roast the hazelnuts in the 350ºF oven until aromatic and lightly browned — about 7 to 15 minutes, rotating once midway to evenly roast them. Wait until they’re cool enough to touch, then remove any remaining loose skin bits. Set aside to cool completely. In the meantime, brown the butter in a sauce pan until the solids are orange-red (like paprika). Set aside to cool. In a food processor, grind the hazelnuts, sugar, and salt into a meal. The meal might clump a little bit, but doing multiple short pulse will help avoid making a paste. In a large jug or bowl, mix the nut meal + sugar with the flour. Stir in the browned butter, then gently whisk in the egg whites until smooth. (optional) If you love chocolate with hazelnuts (me me me), pop one or two chocolate discs into each cookie. Bake for 17 to 24 minutes in oven preheated to 350ºF — give or take, depending on your oven and size of baking molds—rotating after around 12 to 13 minutes. They are done when the centers form a dome—it’s okay if the centers crack a bit!—and the tops become lightly golden brown. 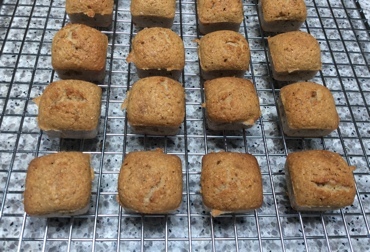 Cool for about 5 minutes; any longer in a silicone pan and the financiers are more difficult to remove as condensation forms on the cavity bottoms, making them more sticky. I usually turn the pan upside down over a rack and poke the molds’ bases to remove them. This was written by sairuh. Posted on Wednesday, August 20, 2014, at 11:37 am. Filed under Food. Tagged cashews, cookies, French, hazelnuts, recipe. Bookmark the permalink. Follow comments here with the RSS feed. Post a comment or leave a trackback.